A look at some beautiful Hummel figurines and how collectable they are. Not a definitive guide to M I Hummel figurines, just a quick look at the style and features of a Hummel figure. This small collection is intended to show the style rather than inform on technical collector details. Relevant makers marks can be found in the Hummel Marks. From TMK-1 to TMK-8 and The Bee Mark section. 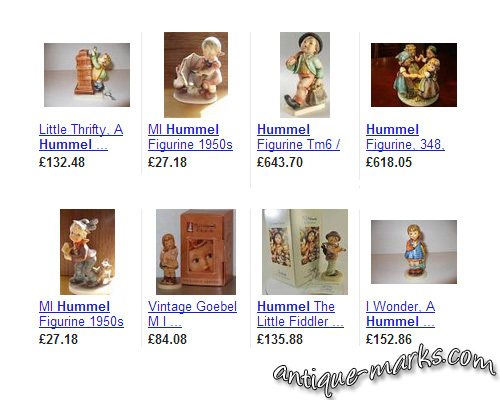 We have added some collector details where possible and included details of Hummel marks. 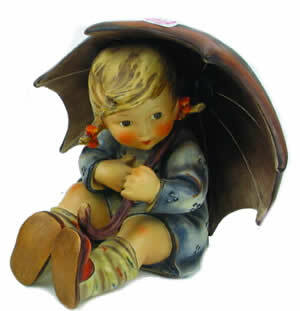 A large Hummel umbrella girl figure. Umbrella Boy Hummel 152/0B 4 3/4″ Artist Signed 80. Little Fiddler HUM 2/II CE (10-3/4″). This figure was originally molded by master sculptor Authur Moeller in 1935. It is the same boy in “Puppy Love”. Old Names are Violinist and The Wandering Fiddler. 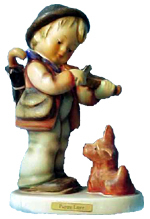 It depicts a boy in a hat with a blue tie carrying an umbrella and bag while playing the violin. An example of the first Hummel released entitled “Puppy Love,”. HUM 1, TMK 3 (Stylized Bee). Since it was only released in one size (5 to 5-1/4″), there is no size indicator on the underside of this Hummel. It was discontinued while in TMK 6 with a FINAL ISSUE in 1988. 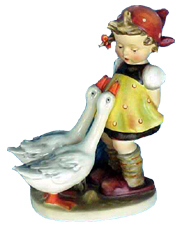 HUM 47/2, TMK 1 CE – Perhaps the most popular Hummel figure “Goose Girl.”. The underside shows a clear incised “Crown” at the bottom of the underside at (6 o’clock). 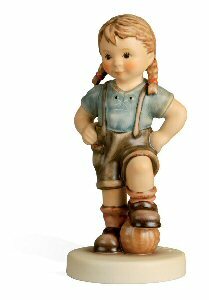 HUM 141/V, 10.25 inches – This Hummel Figurine was first produced in the 1970s. 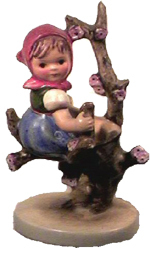 The Apple Tree Girl has a girl sitting on the branch of a tree looking over her right shoulder and wearing a red scarf. 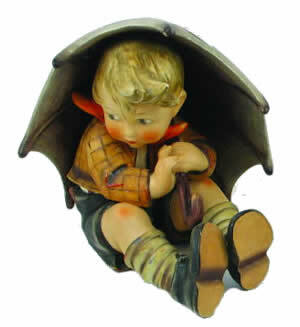 A rare Hummel figurine standing 10 1/4 in. tall. He is a boy with blue jacket and green cap, sitting in an apple tree with a bird near his knee. Hummel Apple Tree Boy #142/V. Premier Collection Figure – Ready to Play is the first M.I. Hummel girl to wear lederhosen and actively participate in a sport. Delightful 4 in. 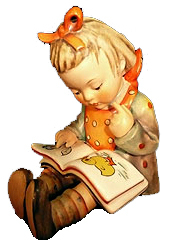 Hummel Book Worm #8 is a little girl sitting with legs outstretched before her. Orange ribbon in her hair, carefully examining a book. 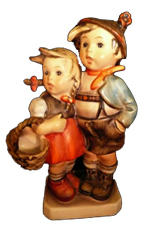 Hummel Surprise #94/1 is a beautiful figurine showing a boy and a girl in traditional dress. They are standing close together as if they were just surprised while walking through the woods. Girl has a basket hanging on her arm. It bears the W. German Mark 1960-1963 and stands 5 1/4″-5 1/2″.